Look what Spud found in the library: The Unofficial Harry Potter Cookbook! 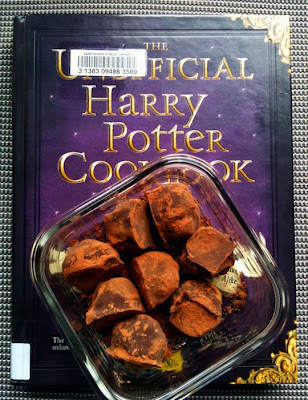 I think he's hoping to bake something truly magical like chocolate frogs that hop and jump but in the meantime he chose Dark Chocolate Truffles as his first recipe. And they are good. But we really don't need these in our house! I hope I can send these super rich magical blobs of tastiness off with Hubs to his work tomorrow.